It is used to connect the LNB(F) on the satellite dish to the receiver. Many people worry about cable length between dish & receiver, and which type to use. Up to 100 metres in length, no special measures are necessary. Use a PF 100 or equivalent. If the cable is to be buried under the soil in a garden, run it inside conduit otherwise it will fail after a few years if the ground is wet. Under an irrigated lawn it can fail in about a year if the ground is constantly wet. The outer insulation breaks down and the inner conductor will start to go black. Avoid sharp bends when fitting cable, and handle it carefully. Clip to a wall so there is no movement in wind. In very hot countries, avoid throwing a cable onto a roof of bitumen or black roof tiles, the outer insulation will fail in a year or two. Take special care when fitting plugs to the ends, make sure there are no tiny strands of outer braid touching the inner conductor. Signal strength varies between LNBs. Some have a high output but this doesn’t mean you will get a better picture. What matters is the signal quality, which is the integrity of the data, expressed in the number of errors (Bit Error Rate or BER). There are thicker cables with a slightly larger inner conductor of about 1.25mm, these thicker cables need a bigger F connector. There are also ‘shotgun’ cables which are two small satellite cables stuck together which will pass through a standard drilled hole. Sky installers in the UK use this, though they are not allowed runs longer than 30 metres owing to increased loss. This type of cable will cause problems with first generation Thomson Sky HD boxes if other receivers are also connected to the dish at the same time. When running a cable into a building, make a ‘U’ bend just below the hole it is passed through, to prevent rainwater running into the house. Use continuous runs where possible. Joins using F to F connectors are alright, though they will introduce some signal loss. Avoid using wall plates, particularly the type which have other services such as phone and normal TV run into them. It is better to just to drill a hole in a blank plate and pass the cable through, thus avoiding a join. Use rubber boots or self- amalgamating tape when connecting a cable to an LNB. A simple F connector with no tape around it is not enough unless you live in the desert. If water gets in to the cable it will sometimes flow downhill and enter the receiver in time. Before it gets that far, the signal will be affected through the receiver may well work. Higher frequencies are often affected when using inferior cable as the attenuation is greater with frequency. If using a cable which is poor, some channels may disappear. Do not use cable with tiny amounts of the outer braid and no foil. These are cheap cables used in the past for regular TV. Expect to pay a relatively high price for good cable, never join together two different types of cable. Interference from Dect phones is a common problem. The frequency most affected is 11642 Vertical, as the intermediate frequency on this channel is almost identical to that used by Dect phones. Intermediate frequency: the signal which is actually passed from the LNB to the receiver after conversion. Move the phone away from the satellite receiver and route cables as far apart as possible, even good quality PF 100 cable will be affected by DECT interference. You can run an earth wire to the dish mounting post if it is in the ground, or just hammer a bit of copper tube about 1m long into the ground next and earth to this. This will help to prevent your receiver being fried if there is a lightning strike in the vicinity. Coaxial cables deteriorate with age, mostly due to the gradual ingress of moisture. Visible evidence is a yellowing of the dielectric and dark discolouration of the copper. Even when a cable does not show these signs, its performance may fall off severely over a period of years. 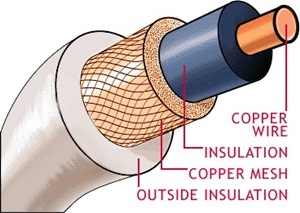 The semi-airspace dielectric with copper braid cables seems to suffer most, probably due to a more permeable outer sheath and the lack of a foil screen that serves as a moisture barrier. It is quite common for an LNB to have high signal strength but poor quality. In weak signal areas, this will mean no picture. A better quality LNB might have lower signal strength but higher quality. On a run in excess of 100 metres, the signal strength will be reduced by the cable, though quality may well be unaffected. Over 100 metres, it is alright to use a line amplifier in the middle of the run, which amplifies the signals. There are no types of LNB which are ‘better on long runs’, this is a myth. The expression ‘semi-airspaced’ refers to the construction of the white dielectric and means that it has ‘cells’ (holes) running through it longitudinally. All semi-airspaced cables seem to have five cells. These cables are identical to the Semi-airspaced dielectric type, except that they have a foam rather than semi-airspaced dielectric. Semi-airspaced cables can deform quite easily if mishandled, and for that reason foam cables, which are more robust when bent and crushed, are making a comeback. The foam cables of yesteryear absorbed atmospheric and other moisture very readily, causing severe performance degradation, however, the modern products are free of this defect. This type of cable is similar in price to the type ‘A’ ones, or perhaps slightly cheaper. Products available include Webro WF100 and Cavel QF100. Semi-airspaced dielectric with copper braid cable is not suitable for with satellite TV. It has no foil wrap and is commonly called ‘low loss’, a designation that originated in the early days of UHF transmissions, to distinguish it from the smaller diameter, solid dielectric cables used for VHF. It usually has a brown outer sheath, although the DIY sheds stock it in white. Over the years the braid density of ‘low loss’ has decreased mysteriously. In 1969 it was quite a job to unravel the braid when fitting a coax plug; now there’s hardly anything to unravel! Some manufacturers still produce this type of cable with braid coverage as high as 60%, but these products are rarely used. Much more common are the cheap versions with braid coverage of as little as 20%. See Co-ax cable quality – how much does it matter?